LET’S KEEP OUR VILLAGE BEAUTIFUL. Volunteer Hour. Starts 2 May. Every Monday 7-8pm. Meeting outside Annascaul Community Centre. Tidy Towns involves more than tidiness, litter control and flower displays. It is important to be aware of all categories so that we can improve on last year. Community involvement is the key to success and we ask all residents and community groups to support our efforts to have our village looking its very best for the summer. With the help of grant aid from SKDP we now have information Boards located at the Inspiration Lodge and the Tom Crean Memorial Garden Annascaul Walks have also received SKDP grant aid for the Walking Trails Board located at the Tom Crean Garden. 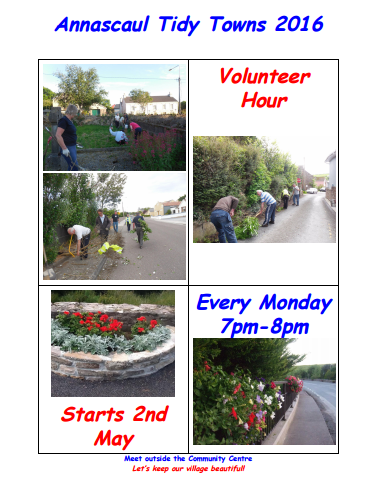 Annascaul Tidy Towns AGM will take place on Monday 23 May @ 7pm Annascaul Community Centre. Why not come along & give suggestions & thoughts on how we all can improve our beautiful village. All Welcome.